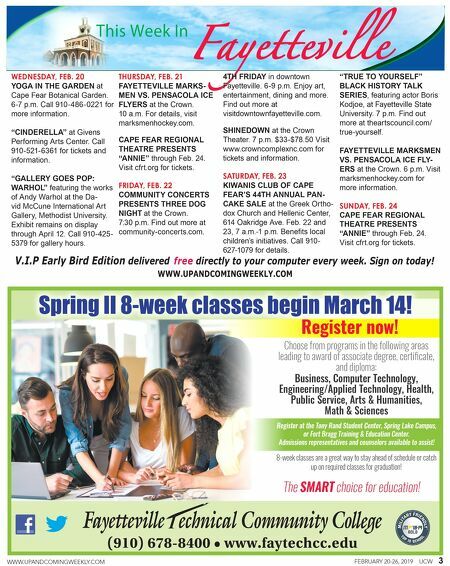 WWW.UPANDCOMINGWEEKLY.COM FEBRUARY 20-26, 2019 UCW 3 Choose from programs in the following areas leading to award of associate degree, certificate, and diploma: Business, Computer Technology, Engineering/Applied Technology, Health, Public Service, Arts & Humanities, Math & Sciences Spring II 8-week classes begin March 14! The SMART choice for education! 8-week classes are a great way to stay ahead of schedule or catch up on required classes for graduation! (910) 678-8400 • www.faytechcc.edu Register now! Register at the Tony Rand Student Center, Spring Lake Campus, or Fort Bragg Training & Education Center. Admissions representatives and counselors available to assist! V.I.P Early Bird Edition delivered free directly to your computer every week. Sign on today! 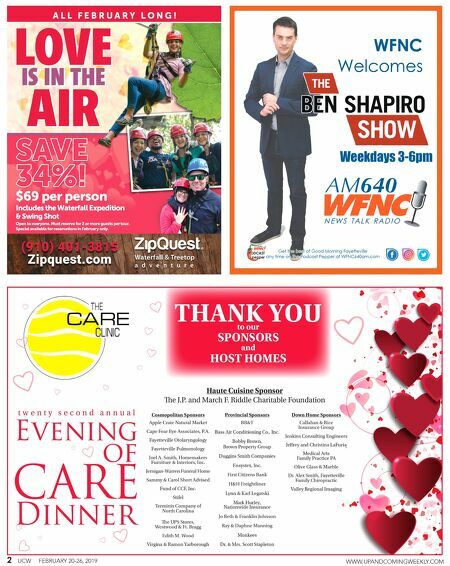 WWW.UPANDCOMINGWEEKLY.COM This Week In Fayetteville WEDNESDAY, FEB. 20 YOGA IN THE GARDEN at Cape Fear Botanical Garden. 6-7 p.m. Call 910-486-0221 for more information. "CINDERELLA" at Givens Performing Arts Center. Call 910-521-6361 for tickets and information. "GALLERY GOES POP: WARHOL" featuring the works of Andy Warhol at the Da- vid McCune International Art Gallery, Methodist University. Exhibit remains on display through April 12. Call 910-425- 5379 for gallery hours. THURSDAY, FEB. 21 FAYETTEVILLE MARKS- MEN VS. PENSACOLA ICE FLYERS at the Crown. 10 a.m. For details, visit marksmenhockey.com. CAPE FEAR REGIONAL THEATRE PRESENTS "ANNIE" through Feb. 24. Visit cfrt.org for tickets. FRIDAY, FEB. 22 COMMUNITY CONCERTS PRESENTS THREE DOG NIGHT at the Crown. 7:30 p.m. Find out more at community-concerts.com. "TRUE TO YOURSELF" BLACK HISTORY TALK SERIES, featuring actor Boris Kodjoe, at Fayetteville State University. 7 p.m. Find out more at theartscouncil.com/ true-yourself. FAYETTEVILLE MARKSMEN VS. PENSACOLA ICE FLY- ERS at the Crown. 6 p.m. Visit marksmenhockey.com for more information. SUNDAY, FEB. 24 CAPE FEAR REGIONAL THEATRE PRESENTS "ANNIE" through Feb. 24. Visit cfrt.org for tickets. 4TH FRIDAY in downtown Fayetteville. 6-9 p.m. Enjoy art, entertainment, dining and more. Find out more at visitdowntownfayetteville.com. SHINEDOWN at the Crown Theater. 7 p.m. $33-$78.50 Visit www.crowncomplexnc.com for tickets and information. SATURDAY, FEB. 23 KIWANIS CLUB OF CAPE FEAR'S 44TH ANNUAL PAN- CAKE SALE at the Greek Ortho- dox Church and Hellenic Center, 614 Oakridge Ave. Feb. 22 and 23, 7 a.m.-1 p.m. Benefits local children's initiatives. Call 910- 627-1079 for details.